They pop up seemingly everywhere in Japan. They’re called “yuru kyara” in Japanese and refer to the local mascots dreamt up to promote cities, towns, and rural villages across the country. Inside those mascots, there are people. And more and more, they’re women. Japanese morning show Toku Dane! took a look at the world of “yuru kyara”, noting the mascot boom that’s been sweeping Japan. “Yuru kyara are a cheap and easy way to drum up attention and do PR,” Matt Alt, author of Hello! Please, told Kotaku. Some mascots, such as Hikone Castle’s Hikonyan, have even become popular across the country. One mascot, however, recently came under fire for resembling Pikachu, resulting in the character being binned. Goodbye Pikachu Rip-Off! It&apos;s Been Fun. While American cities might shun the notion of cute or, even, goofy cartoon characters as promotion, Japanese ones have been embracing them. According to Alt, who is currently working on a new book, Japan has a highly developed character culture—hence, the society’s willingness to adopt cute characters. The historical tradition of country’s character culture—which is evident in modern manga, anime, and video games—is evident in the colorful yokai created over the centuries. The term “yuru kyara” first appeared in 2004, when manga illustrator and writer Jun Miura coined it with his book Yuru Kyara Daizukan or “ The Big Book of Municipal Mascots”. According to Alt, the term “yuru kyara”, literally “weak character”, was even copyrighted by Miura. This year’s yuru kyara gathering, the Yuru Kyara Matsuri: Kigurumi Summit 2011,” drew 78,000 visitors. In the segment on Toku Dane!, more and more women are apparently interested in working part-time as yuru kyara. The segment, hosted by Fuji TV announcer Sayaka Morimoto, visited a “kigurumi”, or “character costume” school, called “Chokko Group”. The school’s teacher said the number of students was on the uptick, and the school currently had around a dozen. The school teaches students how to dance and move in the heavy character costumes—as well as sweat. The women featured in the segment were in their 20s and 30s. They said they got interested in kigurumi because it allowed them to have an alter ego and they loved how excited kids became. It’s not only the attention that has inspired would-be kigurumi. 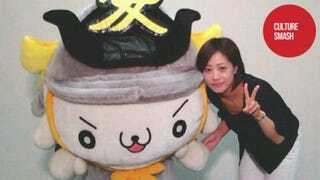 For example, Yuki Aida grew up in the sleepy town of Yonezawa, but moved to Tokyo after graduation. She returned home after her father became ill and was surprised to see how the town had changed: Shop fronts were boarded up and the streets were empty. Aida took a job with the city and became dressed up as Yonezawa’s yuru kyara, Kanetan, hoping that it would help make Yonezawa a bit more lively, a bit more fun, a bit more like she remembered it.